COLUMBIA, Mo 2/25/16 (Beat Byte) -- National and international media are reporting another Mark Schierbecker-films-Mizzou video. 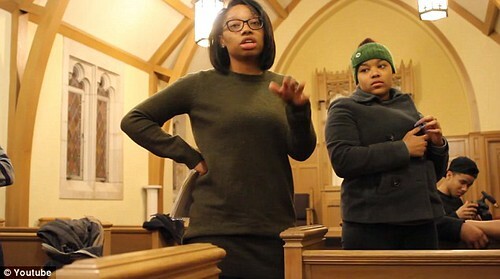 Posted on his Youtube page, the roughly 6-minute video documents black Concerned Student 1950 (CS1950) participants asking Schierbecker and white reporters to leave a Feb. 10 meeting of about 12 people in a public, Mizzou-owned chapel. Fox News, the UK Daily Mail, and College Fix are among news outlets to report what becomes another touchy, on-campus, inter-racial encounter. Best known for his widely-reported video of Mizzou faculty members Melissa Click and Janna Basler, Schierbecker follows the chapel-based gathering as Trib photojournalist Daniel Brenner responds. “Just curious. Are you guys afraid? Why are you asking us to leave?” Brenner -- seated with fellow Trib reporter Rudi Keller -- says. "Just because I asked you to," the CS1950 meeting leader responds. Brenner, Keller, and other reporters exit, leaving Schierbecker "as the sole outsider," he explains. “I'm on assignment for a story. My personal preference is to stay,” he tells another CS1950 participant. "This is considered a limited public forum. It's open to the public and especially students of the university." "So you won't respect our privacy?" "If by that you mean I choose not to leave, I am going to stay," Schierbecker says. The group leader approaches him. "This is, once again, white people being privileged and refusing to leave our space," she says, as other cell phones emerge to record the encounter. "I don't think we can have a productive meeting with him, so we can go someplace else," another participant says. The video cuts to an apparent compromise: Schierbecker can stay if he doesn't record anything. When another young woman explains the group's frustration with cameras, the leader interrupts. "That's not necessary," she says. "You don't owe him any explanations. We'll just go ahead and fill out a racial bias incident report and move forward. I don't have time. I don't have patience." A "racial bias incident report" would be filed with the MU police. "This was advertised on Twitter as a public event, albeit for only 'colored people'," Schierbecker explains, igniting a mini-firestorm. "I don't know that that's the message that was intended, but the official flyer said 'Calling all black students and students of color for a Concerned Town Hall'," he adds, with a shot of the flyer and its raised, so-called "black power fist." Other participants insist that, "as the only non-colored person here," Schierbecker respect their privacy and not record anything. They do acknowledge the chapel is a public space. Another firestorm after Schierbecker remarks he is "recording for my own physical safety," adding, "You called MUPD on me. You called campus police!" More discussion follows room-wide shushing and calls to "Chill out!" "I'm recording, so that when the police report comes out and they ask me what happened, I can just show them this recording," Schierbecker explains. "We feel unsafe because you walked in on black students, recording," another participant says. "If MUPD is not going to call me later and say that I said something, and I'm gonna be placed under arrest, I will put the camera away," Schierbecker says. More back and forth about the possibility of MUPD arresting Schierbecker follows, then a sudden about-face, as group participants rise. "We're going to go ahead and leave this space," the group leader says. "You're welcome. We appreciate you. Thank you for your time." Schierbecker reported no contact with police after the scuffle. PROMINENT MIZZOU STUDENT ACTIVIST: Condemns ConcernedStudent protests as "selfish betrayal"